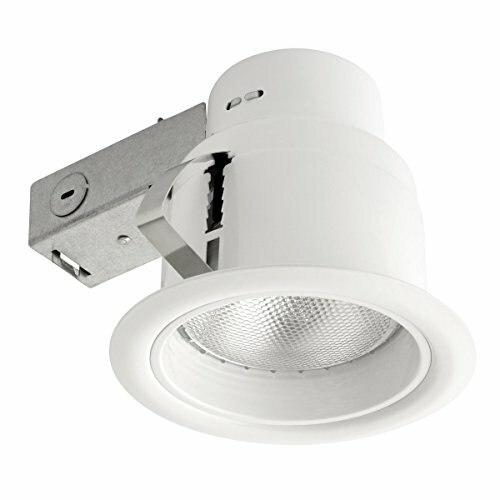 Globe Electric's 5" Rust Proof Indoor/Outdoor Ridged Baffle Recessed Lighting Kit with white finish is the perfect way to brighten up the interior and exterior of your home or commerce with style. Featuring patented PUSH-N-CLICK clips which are fully adjustable and extra wide to grip uneven surfaces and provide easy tool-free installation. A regressed ridged baffle reduces glare making your lights easy on the eyes. Completely dimmable with a compatible dimmer switch. An integrated cut-off switch ensures that the fixture will not overheat and can be used with or without an insulation box. Requires one 75W PAR30 or 65W BR30 E26 light bulb (sold separately).